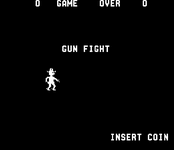 Gun Fight is an arcade game that was released by Midway Games in 1975, based on the Taito game Western Gun, designed by Tomohiro Nishikado (the creator of Space Invaders) and released earlier that year. The theme of the game involved two Old West cowboys squaring off in a duel. Each is armed with a revolver and whoever draws fastest and shoots the other cowboy wins the duel. Unlike a real-life duel, however, both cowboys always get numerous opportunities to duel in order to score points (one point per successful draw). Western Gun was an early two-player, run & gun, multi-directional shooter. It was also the first video game to depict a gun on screen, introduced dual-stick controls with one joystick for movement and the other for changing the shooting direction, and was the first known video game to feature game characters and fragments of story through its visual presentation. Source: Wikipedia, "Gun Fight", available under the CC-BY-SA License.